GERMANY: Siemens has won a contract to supply turbines with a capacity of 24MW to extend a community wind farm in northern Germany. The Klixbüll project will have its capacity increased from 15MW to 39MW with the addition of eight Siemens direct-drive SWT 3.0-113 turbines. 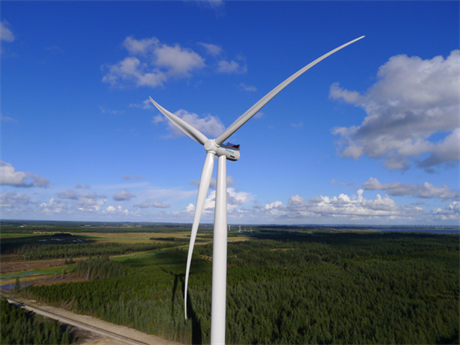 The fully citizen-owned Zweite Klixbüller Energie operates the project in Schleswig-Holstein, where six Siemens SWT 3.6-107 turbines have been operating since 2006. Installation of the turbines is expected to be completed in the third quarter. As part of the deal, Siemens will provide operations and maintenance services for 20 years. At night the turbines must operate under a noise-control mode due to the project's location close to homes. Siemens said that the turbines will still be capable of producing more than 2MW while restricted in this manner. When the wind is not blowing, the turbines will be used as phase shifting VAR compensators. This means that they will help solve a technical problem with the alternating current voltage grid caused when industrial customers draw large amounts of energy, disrupting supply frequency. This can lead to overheating of the power cables, which can be corrected by the turbines through a counteracting of the frequency shift to stabilise the grid. The project can charge for this service and thus increase revenues.